In an age when screen courtships tend to occur between incredibly gorgeous couples and last only a nanosecond before copulation occurs, it’s refreshing to watch the tentative steps of Patricia (Wendy Hughes) and Peter (Norman Kaye) as they inch their way toward their first kiss, which happens around the 50 minute mark in Paul Cox’s Lonely Hearts. Written by Cox and comedian John Clarke, the story is a tender portrayal of two awkward people finding themselves through each other late in their respective lives. Hughes demonstrates her remarkable talent by transforming from the great beauty that she is into a dowdy, frigid bank clerk and Kaye also impresses with his mild mannered attempts to try to attract her. His toupee-wearing, piano playing Peter is a picture of self sacrificing modesty until he’s busted stealing things from the supermarket and pretending to be blind while tuning an old woman’s upright. But ironically, such foibles eventually convince Patricia that this is a man to be trusted. We all have our weaknesses, after all. Through Peter, Patricia discovers the joys of amateur theatre and the work of August Strindberg and even finds herself starring in a production of ‘The Father’. She has more than a few issues with her own domineering father too; at the age of 30 she has only just managed to break free from his oppressive clutch. 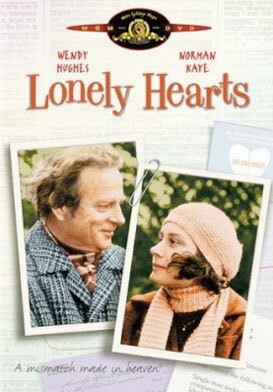 Peppered with delightful cameos by some fine actors including Jon Finlayson as the flamboyant theatre director and Kris McQuade as the girl that Peter employs from Call-A-Kitten to try to alleviate his anxieties, Lonely Hearts is a gentle movie about the healing power of love. It won the AFI Award for Best Film in 1982 and still touches the heart with its beautiful observations of human relationships and flawed characters.